New Position Added to Pro-Cam Services LLC. Pro-Cam Services LLC. Is proud to announce the addition of a new position to our organization! Pro-Cam Services LLC. has added a Shop Foreman to our team with over twenty years of job shop machining experience. The new Foreman position will lead the shop floor, help with increasing efficiencies, quickly solve any problems to ensure jobs stay on schedule, help with scheduling, increases on-time delivery and improving the accuracy of status updates to our customers. We are super excited about this new addition to our team! Remember Pro-Cam Services LLC. 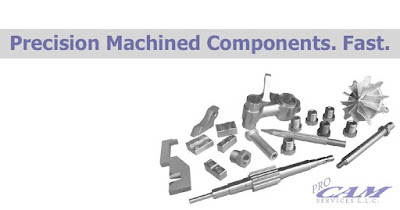 offers fast precision machining services to a wide variety of industries. Both our FAST TRACK SERVICE and our STANDARD DELIVERY SERVICE operate on very short lead times and we can often deliver precision machined parts to you much faster than others in our industry. Try us for your rush delivery and/or prototyping needs. We also do a wide variety of made to order machining projects in both low and high quantities for a variety of industries!